At Cancun Getaways we offer Palace Resorts and certain Hard Rock Hotels all inclusive vacations featuring 11 resorts, each with a unique theme in mind. They are located on the Cancun Hotel Zone, Isla Mujeres, Playa del Carmen, Rivera Maya, Cozumel, Nuevo Vallarta (Pacific Coast) and Punta Cana DR. When you stay at any one of Palace Resorts’ facilities, you may enjoy all of the other Palace Resorts all-inclusive activities, restaurants, pools, and beaches at no charge. 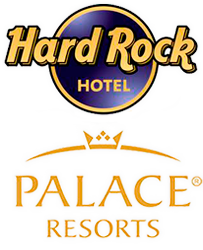 Hard Rock Hotel facilities are in Cancun, Riviera Maya, Puerto Vallarta and Punta Cana Dominican Republic. For A Fraction Of The Cost! Enjoy the benefits of a VIP Golf timeshare membership without having to purchase one.All Vacations must be for a minimum of 2 adults, 7 or more nights! When you compare Our Palace Resorts Rates to others, please note that their rates are per person; ours are for TWO people, giving you the best price for an all inclusive vacation. As “Palace Premier Corporate VIP Members with Unlimited Golf”, we have access to ammenties not offered by other travel agents or travel packages. For example, our all inclusive golf package includes unlimited golf and carts. This alone can save you hundreds and even thousands of dollars if you plan to golf every day during your vacation. Palace Resorts are Cancun’s premium facilities for all-inclusive resort packages. If you are looking for the best experience for your Cancun Vacation, please send us your request by completing the Contact Us or email Michelle@CancunGetaways.com. Ready to experience the ultimate Caribbean Vacation? LET'S GO!